The PATS program is coordinated by a Trainer who follows the process in the Pickleball Bible Manual. Each stroke is described with specific tips (techniques) in the Pickleball Bible Manual. Each stroke area has accompanying links to a video that demonstrates the correct form for completing the stroke. Stroke scores of players are entered into an online database. The player sores are accessible immediately after the session. click here to see a sample of a PATS score sheet. To summarize, 4 players plus the Trainer help each Player Buddy drill with focus. The emphasis is on cooperation and "playing with purpose", not competition. The Pickleball Bible Manual is the PATS program core resource for stroke instruction. It is a manual built on research. PATS is not a program that provides instruction on all the different stroke techniques within a given time period. It is a program that provides drills with a mindful purpose. The repetition of those drills develop the “muscle memory”, the autonomous response that can be grown only by repetitive drills, both physical and mental. 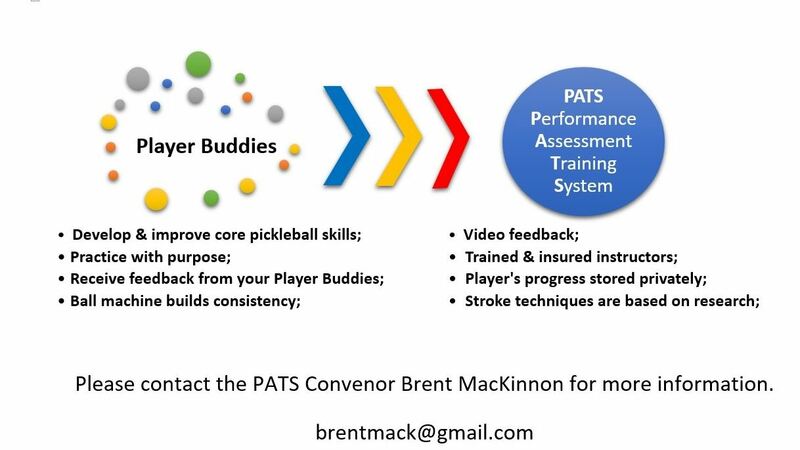 PATS purpose is to have players achieve autonomous hitting ability. PATS uses the Pickleball Bible (and other researched sources) material to help players understand stroke techniques. PATS does not mindlessly move players through a series of core pickleball strokes. If a student is not motivated for following the PATS protocol, they should not take the program. A ball machine for developing pickleball skills lessens the role of the "expert coach". A ball machine gives consistent ball tosses. Players don't feel performance pressure as they would with a "quasi expert" who is unlikely to have a formal certified coaching experience. Each stroke skill has a comprehensive breakdown of tip descriptions complete with links to videos that illustrate correct stroke mechanics. Click here to view and download the complete Pickleball Bible (manual).